The title of this stone sculpture, “2500 Beetles Per Day”, refers to the number of Mountain Pine Beetles a Hairy Woodpecker can eat in a day if it fills its tummy 3 times. As an independent artist, I have the cherished ability to express my thoughts through my art. Sometimes my work is less a celebration of the natural world and more a meditation on what we risk losing. My endangered species sculptures of the tiger and the leatherback sea turtle are examples. Mountain Pine Beetles are very small, about the size of a grain of rice. Yet they have killed 8 million acres of lodgepole and ponderosa pine in Colorado, Wyoming, Idaho, and Montana as of 2010. This is tiny acreage when compared with the 43 million acres the bugs have killed in British Columbia. Our forests are in crisis. Significantly warmer winter temperatures no longer kill the beetles. Warmer summers allow the beetle larvae to mature in one summer instead of two, which used to be the norm. Due to warmer temperatures, they can also exist farther north on the continent, and at higher altitude in the mountains. Human intervention through burning and clear-cutting to try to stop the beetle has not improved the situation, and may be making it worse. When the forests are in trouble, we are in trouble. Trees absorb massive amounts of carbon dioxide, and store and release water influencing rainfall and flooding. We are all connected. The old moniker, Spaceship Earth, is still a good metaphor. The stone is Mongolian Imperial Black Marble, raw where it is light-colored, and polished to 10,000 grit where it is shiny black. The red patches on the head are Red Travertine–ground up, mixed with resin, tucked into the holes, and sanded clean. 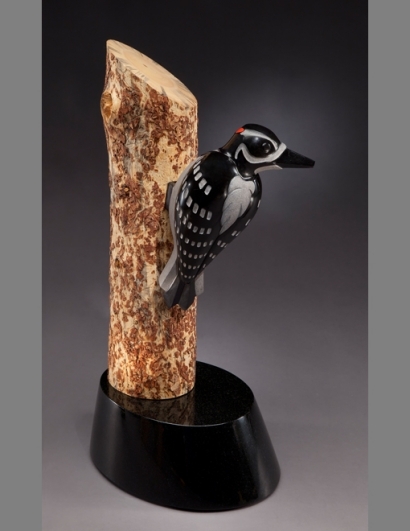 The woodpecker, himself, is 10 inches long–a little jewel! The tree is beetle-kill lodgepole pine. The thin outer bark was sand-basted off to reveal the larvae trails. The gray streaks in the wood are called Blue-stain and result from a fungus the Mountain Pine Beetle brings along with it to feed the larvae. This was my first adventure with wood as a sculptural medium, and I was amazed at how much easier it is to cut and sand when compared with stone. An obvious no-brainer, but I’d never thought about it before. Even so, I love the challenging nature of stone and the creativity it inspires for me. Information on the Mountain Pine Beetle and forest die-off comes from Empire of the Beetle by Andrew Nikiforuk, and The Man Who Planted Trees by Jim Robbins.